I hope the New Year is treating everyone well. As you can tell, I sort of took the Holidays off from blogging. 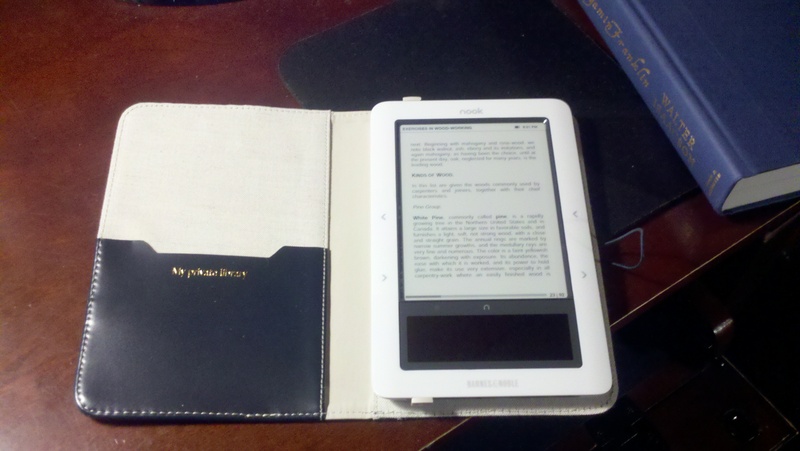 For Christmas, my wife got me the Barnes & Noble Nook Wi-Fi, and I am enjoying it thoroughly. I like e-ink as it is easier on the eyes than a backlit LCD display, especially since I do the majority of reading at night, usually just before bed. I charged it up for the first time Christmas night, and I have yet to need a full charge – it’s at about 80% currently. I will say I have hooked it to my computer a couple of times to transfer some pdf files. So in these cases, it did have a few minutes of charging while transferring, probably about 15 minutes total. Navigation is done by what I found to be an intuitive color touchscreen below the e-ink screen. The first book I read on it was Charles Dickens’ A Christmas Carol, which is free as a “NookBook”. The next one, that I am currently still reading, is Exercises in Wood-Working by Ivin Sickels (this is the F+W Media/Popular Woodworking release of this title). Also, as I noted above, I connected it to my computer to transfer some pdf based documentation. The formatting of these pdf files stayed intact, and embedded links worked without issue. I did edit the metadata for the pdf files since I found this is how the Nook will display this information in the My Documents display (some of the pdfs had differing or no metadata). For this, I used a free utility called Calibre, which also gives a nice option to copy to the device. If you don’t need to edit metadata, it’s easy enough to copy files from your computer to the mounted drive for the Nook, typically to the My Documents folder. 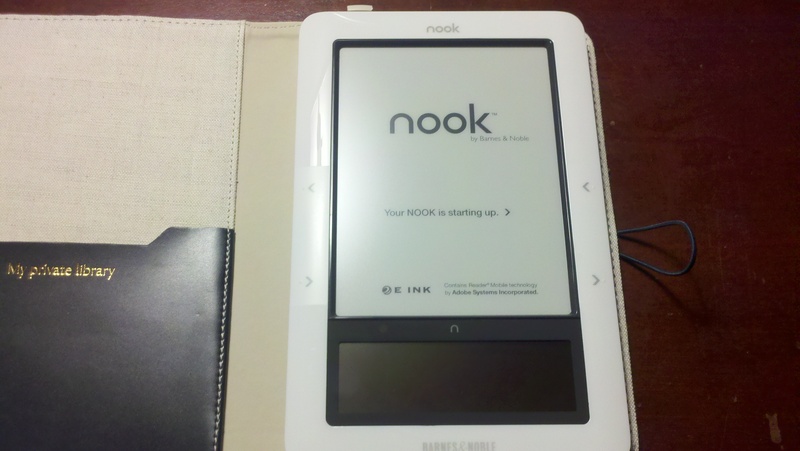 Below is a picure of the Nook booting.